A one piece welded flower urn planter has decorative scrolled legs. Ornamental flower container with deep planting basket. 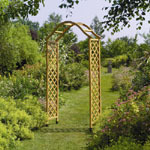 Made from heavy duty steel and powder coated for durability. Manufactured in Great Britain, help reduce your carbon footprint, buy British. The outdoor metal urn compliments all wooden planters, wrought iron planters, flower containers and window box planters. Liners not included but available in our store. The metal urn measures: height - 43cm (17"), length - 33cm(13"). The metal urn measures: height - 53cm (21"), length - 40cm(16"). This metal flower container is made in Great Britain, help reduce your carbon footprint by buying British. This sturdy two tier flower planter has decorative scrolled feet for added decoration. The patio container is manufactured from heavy duty steel and powder coated for durability. Stunning flower metal garden planters compliment all gardens. Total height - 85cm (33"). Top basket - 30cm(12") diameter. Bottom basket - 40cm(16") diameter. These stunning heavy duty metal garden patio planters create height and are spectacular in any garden, patio or balcony. The metal baskets compliment all wooden planters, wrought iron planters and window box planters. Handmade in Great Britain, help reduce your carbon footprint, buy British. 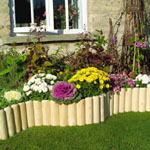 Manufactured from heavy duty steel and powder coated for durability these flower containers provide a striking garden feature. Liners not included but available in our store. Total height - 95cm (37"). A one piece welded flower patio planter has decorative scrolled legsfor decoraton. A stunning piece of ironwork manufactured from heavy duty steel and powder coated for durability. Manufactured in Great Britain, help reduce your carbon footprint, buy British. Compliments all gardens with wooden planters, wrought iron planters and planters boxes. Liner not included but available in our store. The flower patio container measures: height - 40cm (16"), length - 75cm (30"). A stunning urn, with pleasing shape and decorative legs, this product will add gravitas to your displays. You could fill it with trailing fuchsia plants for a breath-taking display. Hand made from steel construction and black P.V.C coated. Made in Great Britain. This wrought iron cradle planter are made from solid rod and square section construction. The flower planter have distinctive barley twist decoration. Strong welded joints. Tough epoxy (not plastic) coating for durability and the wrought iron look. A quality liner is included with the flower basket. 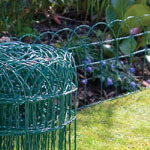 These metal trough planter's compliment all window boxes and hayracks in the range. The wrought iron patio planterss are made from solid rod and square section construction. The flower planter have distinctive barley twist decoration. The wrought iron patio 2-tier planters are made from solid rod and square section construction. The flower planter have distinctive barley twist decoration. Size : 85cm (33") High x 35cm (14") Top basket x 40cm (16") Bottom baskket. The wrought iron patio jardiniere are made from solid rod and square section construction. Strong welded joints. Tough epoxy (not plastic) coating for durability and the wrought iron look. A quality liner is included with the flower basket. These metal trough planter's compliment all window boxes and hayracks in the range. 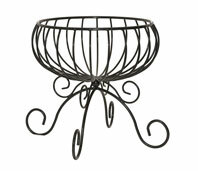 The wrought iiron patio cauldron planters are made from solid rod and square section construction. The flower hanging baskets have distinctive barley twist decoration. Strong welded joints. Tough epoxy (not plastic) coating for durability and the wrought iron look. A quality liner is included with the flower basket. These metal cauldron planter's compliment all window boxes and hayracks in the range. This outdoor planter is manufactured from heavy duty steel. The Spanish Hanging Basket is powder coated for long lasting looks. Manufactured in Great Britain, help reduce your carbon footprint - buy British. The mteal hanging basket is made from strong robust construction which compliments all garden planters. A two piece basket featuring decorative spiral at the base of the basket with detachable hanging arms. Manufactured from heavy gauge iron construction. These metal planters are extra deep for good root growth. Size: 35cm (14") diameter. Height 33cm. Size: 45cm (18") diameter. Height 42cm. Size: 35cm (14") diameter. Height 47cm. Size: 45cm (18") diameter. Height 56cm.